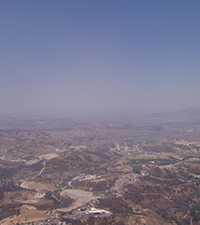 Scientists determined that high concentrations of nitrogen oxides influence the creation of the brown haze that hangs over megacities, providing new insights that can create higher accuracy climate and atmospheric models. Image: Alex Laskin. Enlarge Image. Results: Sitting on an airplane flying into nearly every major city on a sunny day, passengers can see a lingering brown haze. This haze event is linked to climate issues, as the thousands of chemicals involved act as a warming blanket, absorbing sunlight and trapping surface heat. Yet, the chemistry of this haze is not well known. 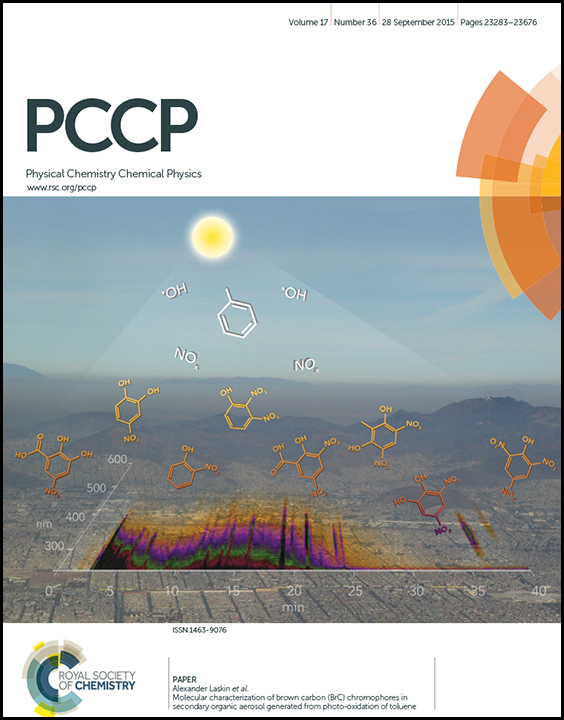 Recently, scientists at Pacific Northwest National Laboratory examined the chemistry of brown carbon, a pernicious set of particles in the haze. 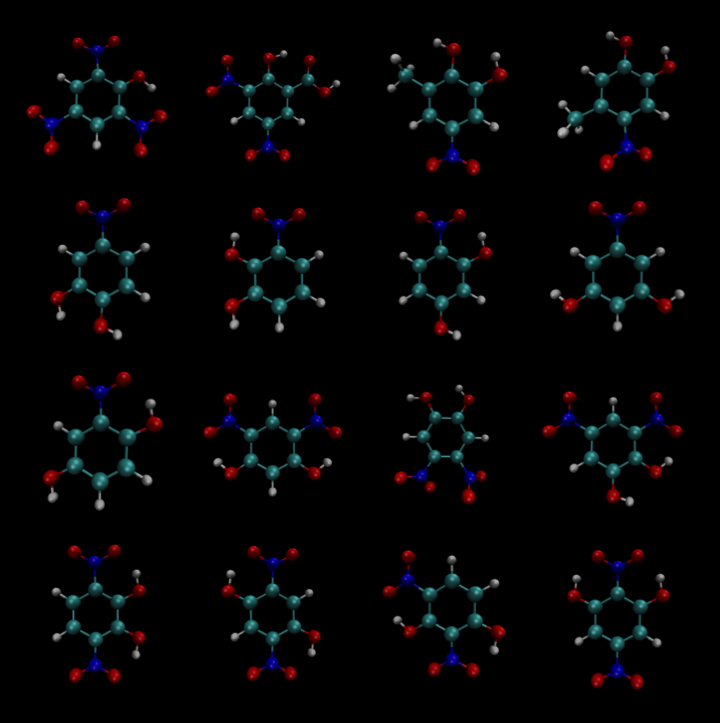 They focused on the specks that form around the chemical toluene, a common pollutant. They found that adding a bit of nitrogen oxide, released in combustion engine car exhaust, resulted in particles that trapped some heat. 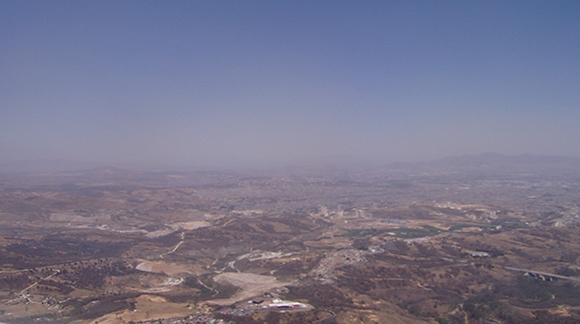 Increasing the nitrogen oxides level, however, resulted in particles that held significantly more heat and caused the mix to turn yellowish brown. 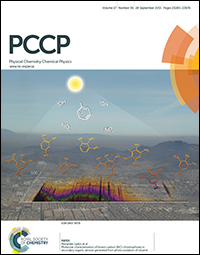 The results are highlighted on the cover of a recent issue of Physical Chemistry Chemical Physics. Why It Matters: To deal with today's air quality issues and minimize future problems, scientists need to accurately predict the structure and behavior of the different types of particles involved. This study provides new insights into the evolution and behavior of a less studied type of particle, called “brown carbon.” Brown carbon is composed of organic molecules that absorb and retain heat. The results could lead to better predictive models to inform future decisions about energy production and use, and a better understanding of changes in the climate. Methods: The team at PNNL took a make-measure-model approach. Dr. John Shilling and Dr. Jiumeng Liu synthesized the brown carbon particles by mixing the common anthropogenic pollutant toluene with nitrogen oxides inside PNNL's environmental chamber. They exposed the resulting gas to light, photo-oxidizing the mixture to mimic the natural aging process that occurs in the atmosphere. The result was particles with characteristic brown carbon properties. 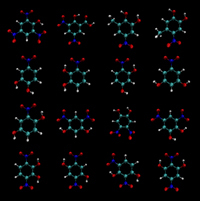 Testing candidate molecular structures that resulted from the mass spectrometry studies of brown carbon material, the team found that three molecules absorbed light in the visible part of the spectrum (on the bottom row, the 1st, 2nd, and 4th from the left). The atom colors are cyan (carbon), red (oxygen), blue (nitrogen), and white (hydrogen). Graphic courtesy of the authors. Enlarge Image. They passed the brown carbon material to Dr. Alex Laskin, Dr. Julia Laskin, and Dr. Peng Lin. Using analytical capabilities in EMSL, including high-resolution mass spectrometry, they investigated the molecular structures and optical properties of chemical components of this material. With the experimental results in hand, Dr. Shawn Kathmann ran a series of detailed calculations. He identified the excited electron states in 15 chromophores, or light-absorbing structures, and provided theoretical chemistry insights on the mechanisms by which these molecules take in the light. This result starts to build the roster of players that form the haze observed over cities and lets scientists better predict the properties of other particles. What's Next? The team is doing further studies on the properties of brown carbon to inform computational models to assess energy choices and their influence on the climate. In one sentence: Scientists at Pacific Northwest National Laboratory determined that high concentrations of nitrogen oxides influence the creation of the brown haze that hangs over the world's megacities, providing new insights that can create higher accuracy climate and atmospheric models.